Western riding originated in the United States of America, and is based on the style of riding adopted by working horsemen who would spend hours in the saddle locating, roping and branding cattle. Not only did their horse need to demonstrate excellent cow 'sense', it had to remain calm and relaxed whilst covering large distances, negotiating obstacles such as gullies and bridges, and above all conserve energy. The saddle used on these horses needed to be comfortable for the rider and spread weight evenly over the horse's back. Fully trained horses were ridden with one hand so as to leave the roping arm free, and the horse was expected to work reasonably independently of the rider, following its training and natural ability to anticipate the movements of cattle to make the rider's job easier. A number of competitive western riding events have stemmed from this tradition, and a brief outline of these is given below. This class is judged on the person with the best ability to perform a pattern & handle a horse with precision & safety from the ground. 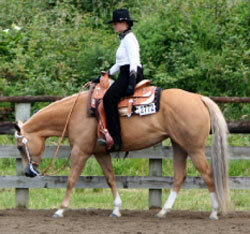 Contestants exhibit their ability to show and control a horse in hand in a halter. They walk, jog, stop, turn around & back up, performing a pattern that has been set & showing their horse to its best advantage to the judge. They cannot touch the horse. It must work off the pressure of the halter & the handler's body commands. A group event where the horse is judged on performance, manners, conformation, quality and substance. Horses are shown at the walk, jog, lope and are also required to rein back. As the event name suggests, the winner of a western pleasure class is a pleasure to ride. The desirable pleasure horse performs without visible commands on a reasonably loose rein and behaves in a calm, obedient and controlled manner. He is a smooth and comfortable ride. A good pleasure horse has a stride of reasonable length in keeping with its conformation. It should have enough cushion to its pastern to give its rider a pleasant, smooth ride. It carries its head in a natural position, not high and not over-flexed at the poll or artificially low. It should flex at the poll and not at the withers. The horse should be relaxed but alert and ready to respond to the rider's commands without resistance or excessive cueing. All transitions should be smooth and easy. The pleasure horse is shown at 3 gaits. Walk: a natural, flat footed, four beat gait. The walk must be alert, with a stride of reasonable length in keeping with the size of the horse. Jog: a smooth, ground covering, two beat diagonal gait. The jog should be square, balanced and with a straight, forward movement of the feet. Horses walking behind and trotting in front are not considered to be performing the required gait. Lope: an easy, rhythmical, three beat gait. Horses travelling at a four beat gait are not considered to be performing a proper lope. The horse should lope with a natural stride and appear to be relaxed. An individual event. Horses are judged on their ability to negotiate various obstacles. 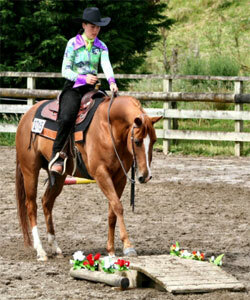 Emphasis is placed upon alertness, caution and obedience to their riders. The horse should be unafraid at all times, but should display interest in the tasks set for it. The trail class is judged on the performance of the horse over obstacles, with the emphasis on manners, response to the rider, and attitude. The horse and rider must complete a set course of obstacles in the specified order and at the specified gait. The course consists of at least 6 obstacles, plus a display of each gait: walk, jog and lope on both leads. Horses are scored on the basis of style, care, reasonable speed and capability of picking their own way through the obstacles when warranted, while responding to the rider's cues when necessary. Trail courses are not designed to trap a horse by presenting obstacles which are extremely difficult or at all dangerous, but rather to test the horse's ability to negotiate things it may reasonably be presented with while being ridden out of the show arena, such as opening, moving through, and closing a gate, crossing a bridge, jumping a small log or pole and backing out of a corner. This is an event where the rider is judged, but the performance of the horse comes into contention. Contestants exhibit their ability to ride and control a horse to a pattern set by the judge. This must include walk, jog, lope, stop and back up. His or her position in the saddle and his or her ability to handle the horse and perform the pattern that has been set out. The contestant will be judged in how well each manoeuvre is performed. Then they also are judged on their position in the saddle. After all the contestants have completed the pattern section of this class the judge will choose the top section of the class, put them out on the rail and ask them to ride a 'rail' section, similar to pleasure. His placing will be chosen from both of these sections. The majority of the marks are taken from the pattern with those placings being confirmed by the performance on the rail. An individual event performed to one of a number of set patterns - mostly at the lope - demonstrating circles, variation in speed, flying lead changes, rollbacks and spins. Each horse is judged on the neatness, despatch, ease, calmness and speed with which it performs the pattern. To rein a horse is not only to guide him, but also to control his every movement. The best reined horse should be willingly guided or controlled with little or no apparent resistance and dictated to completely. Any movement on his own must be considered a lack of control. The horse performs to a set pattern; the selected pattern will be stipulated in the show schedule and is judged on the smoothness, finesse, attitude, quickness and authority displayed while performing the manoeuvres using controlled speed. Horses are required to demonstrate circles, rollbacks, flying changes of lead, spins, reinbacks, variation in speed, and to stop at speed. An individual riding event around a set pattern using specified gaits (paces). Horses are judged on the riding qualities of each gait, flying changes of lead, response to the rider, manners, disposition and intelligence. This is an event requiring a high degree of training for the horse, as it involves a number of flying changes of lead at a controlled pace. Western riding (the event) is one of the most challenging of the western events. The horse is shown at a walk, jog, lope and reinback around a set pattern defined by markers on the ground, through which the horse must weave, demonstrating flying changes with each change of direction. The pattern is performed at a reasonable speed, not fast, but at a pace which allows for flowing changes of lead: too slow and the horse must 'hop' in order to change leads, too fast and the horse will be unable to negotiate the tight corners of the pattern. There are set patterns for this event; the pattern selected will be indicated on the show schedule. Each begins at the walk, progresses to the jog, and then to the lope, finally coming to a halt from the lope and reining back a few steps. The pattern must be ridden precisely to its specifications, if the horse passes on the wrong side of one of the markers or deviates from the pattern in any way it will be scored zero for its performance. Horses are given credit for maintaining an even pace throughout, performing smooth changes of lead at precisely the half way point between two markers and demonstrating responsiveness to the rider. 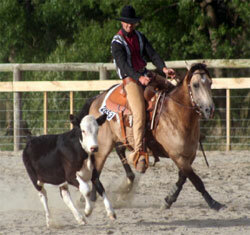 An individual event consisting of a reining pattern followed by cow work. Following completion of the reining pattern, the horse and rider must demonstrate control of the cow by holding it against one end of the enclosure, turning it at least once in either direction, and causing it to complete a full circle in both directions. The horse is judged on maintenance of control, superior cow sense and natural cow working ability. This is similar to a pleasure class, but performed in English attire, with the English set of commands. This event is similar to Horsemanship, but in English attire with English rules of Equitation. The majority of western shows include some timed events at the end of their schedule. The most common of these are the barrel, stake and flag races. In each of these events, the winner is the contestant who successfully completes the course in the fastest time. This is a horse that is 5 years and under. 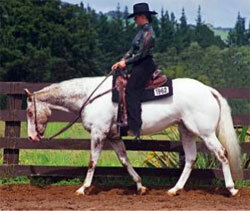 Horses in this category can be ridden in either a snaffle bit in two hands or a curb in one hand. The bosal (pictured) is used in this category as well as to be used correctly a bosal needs to be used with two hands. This is a horse over the age of 5 years. They must be ridden one handed. Mostly in a curb bit, or in western terms a 'bridle'. By the time a horse is in this category it is expected that it will be able to be guided by legs & body predominately & need less influence by the rider's hands. The western term for this is 'broke'. They will be expected to perform tasks with a greater degree of difficulty than the junior horse with less noticeable influence from the rider. They should be able to perform the tasks asked of them quietly & smoothly. Rookie: When a person is new to western riding they are termed a Rookie. 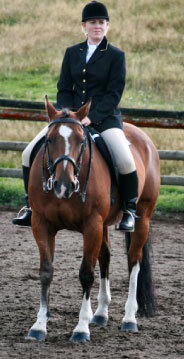 In these classes the rider can ride any age horse in a snaffle bit – two handed. 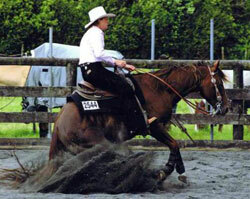 It is considered a class where the rider can learn how to ride western. They will only be riding against other Rookies – so taking away the worry of competing against the more experienced people. A person stays in Rookie until they have 25 points in Rookie classes or a win in an open class. When they get those points they stay in the Rookie division until the following season. So if they start a season a Rookie they can ride that whole season in those Rookie classes. An Amateur is a person who is over the age of 19 years old & has not shown, judged, trained or assisted in training a horse (any horse) for remuneration, monetary or otherwise. Nor have they received money for training another person for 5 years prior to applying for Amateur status with the NZWRF. To compete in Amateur classes they have to own the horse that they are showing. The horse must be registered in their name or the name of their family. The Amateur may place the horse in question with a professional trainer to be trained & they may show this horse in Amateur classes so long as they have applied for & been accepted as an Amateur & hold a current Amateur card & they have paid their own entry fees. You must apply for an Amateur card every year to be able to compete in Amateur classes. You must meet the requirements set out by the NZWRF to do this. You may ride more than one horse in classes like Trail but to qualify for high point awards it will be taken from a rider / horse combination. Novice Amateur is a person who does not have 50 points in Amateur General Performance. General Performance means across a number of events e.g. Trail, Pleasure & Reining. This is also considered a class for people just entering into western riding, where they don't have to compete against the more experienced riders. Amateur is a person who has more than 50 points. Points will be taken as at the beginning of the season that the person applies for their amateur card. This a non points class that allows trainers or professionals to compete against each other, but Amateurs may not enter. It is a class that will be put into the show program at the discretion of the show committee. This is a class that all are eligible to enter. That includes Rookie, Amateur, Professionals & Youth. Adult This is a class that all but youth can enter. Youth must be under the age of 19 years old. It is divided into different categories depending on the age of the youth competing. Senior Youth: This is for youth 14 to 18 years old. Walk & Trot: This is for children 6 to 10 yrs old. It is for youth who are not at the stage of loping their horses, but can control & direct those horses at the walk & jog. The judge will ask for both of these gaits & for the child to back their horse up. Judged on how well they perform these manoeuvres. This is a points approved class with the points going towards an end of year high point award. Leadline: This is for children 6 years & under. 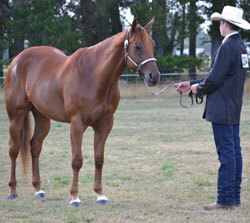 It is a class for children who are not capable yet of controlling their horses without the supervision of an adult. 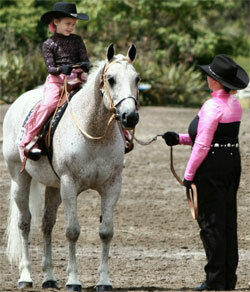 In this class an adult will lead the horse & child around the arena.